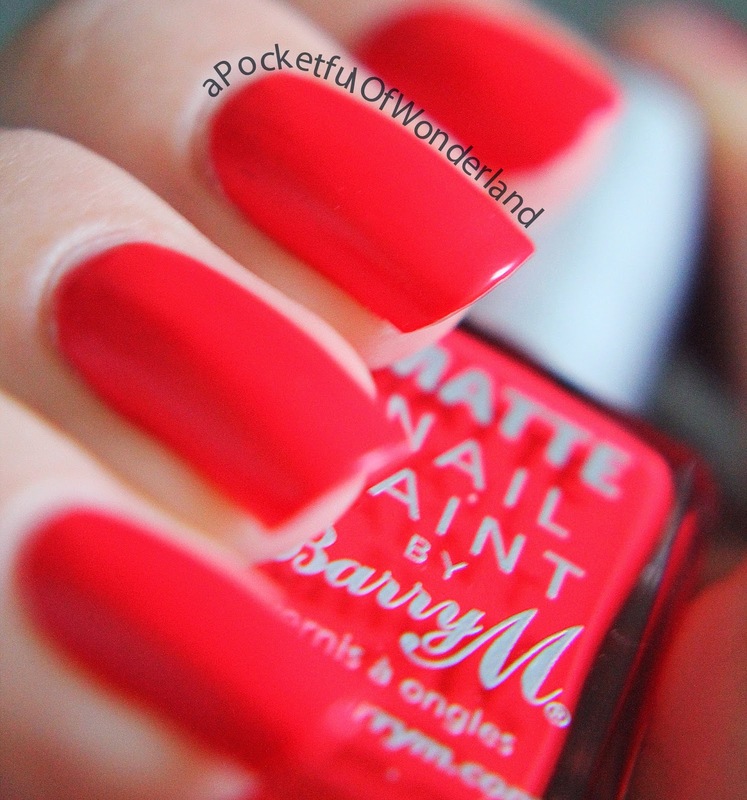 A Pocketful of Wonderland: Barry M Matte Polish; Copa, Copacabaaaaana! 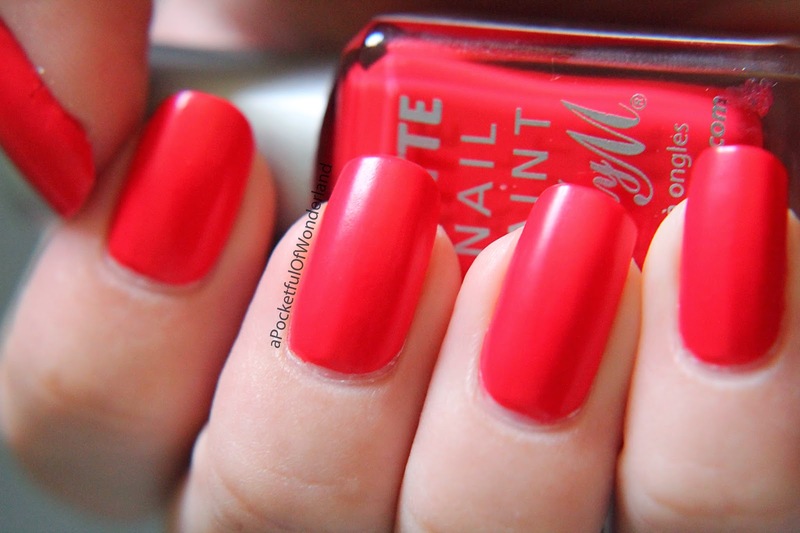 Barry M Matte Polish; Copa, Copacabaaaaana! 'Ello all. I found this beauty at one of my local Superdrugs about a week and a half before the new mattes release date and completely fell in love with it. You may have seen that Barry M have been throwing new products into the mix just recently for their Summer collection. Obviously I've been paroosing the new nail polishes and the Summer 2014 Matte collection really got my attention. So far I have four of the shades in Cancun, Miami, Rhosilli and the shade I have for you today, Copacabana. I've been meaning to get this post written and out for the past two weeks but my brain has been in sleep mode as far as blogging is concerned but, hey, better late than never. 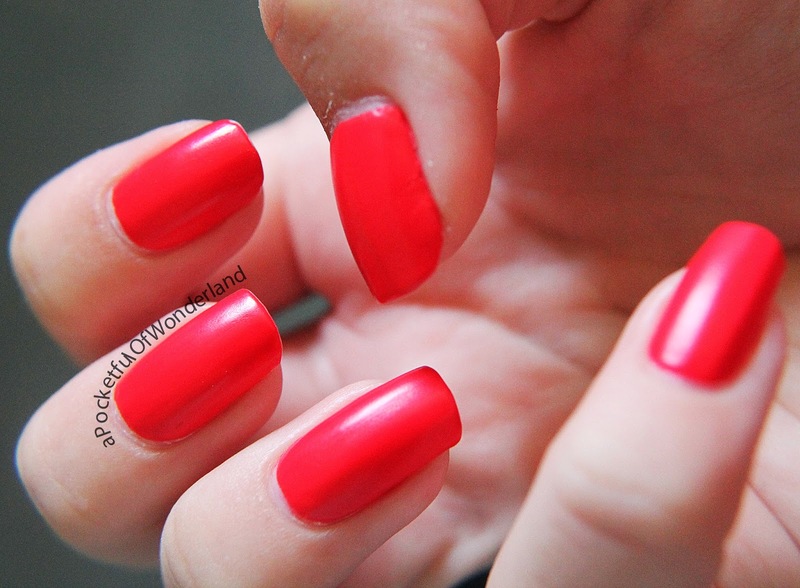 Copacabana is a gorgeous red-coral colour which dries down to a matte finish. I would say it isn't completely matte however, but has a slight sheen to it which, personally, I do like but if you'd rather have a fully matte finish Barry M has also just released their own matte top coat or you can find matte top coats from most brands now. Here I have used three coats just to smooth everything out but two was definitely enough. I wore this for about a week with no chips, just the usual tip wear. You can find Copacabana at Superdrug and Boots. My lack of blogging recently makes me so sad. I've got a back log of swatch pictures all ready and waiting in my folders but I've been so slow in getting round to making posts. A few weeks back my Dad took a few weeks holiday from work and my sister came home from Uni permanently so we spent a week just having some family time. We went off to The Deep, the Yorkshire Wildlife Park, did some shopping and just generally had a nice week. So naturally I'll have some photography posts coming too over the next few weeks once I actually write up the posts.